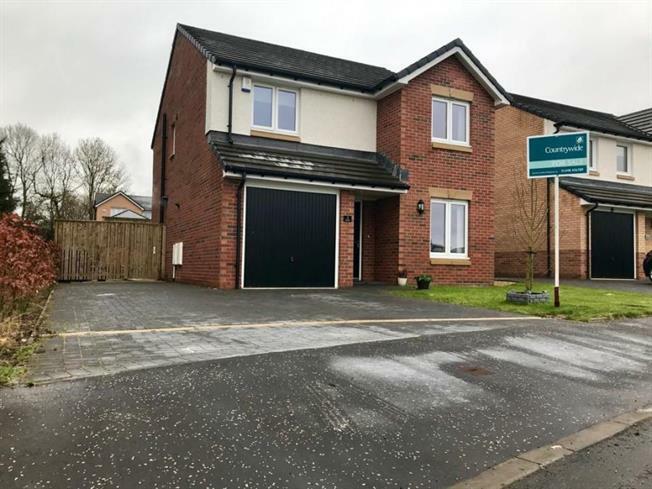 4 Bedroom Detached House For Sale in Hamilton for Offers Over £220,000. Impressive detached villa offered to the market in this desired plot with fantastic outlook at the entrance to this estate. The property comprises of welcoming hallway with all main apartments off. The formal lounge is both bright and airy and has French doors leading out to the enclosed rear garden space. The modern breakfasting kitchen has a range of base and wall mounted units with oven, hob and hood and some integrated appliances. To the front of the property is the formal dining room which has ample room for dining with additional storage cupboard. Completing the downstairs accommodation is the WC. On the upper level are four generous size bedrooms with the master offering built in wardrobes and en suite shower room. Completing the accommodation is the family bathroom comprising a three piece white suite and contemporary tiling. Furthermore the property has gas central heating, double glazing, extensive front and rear gardens with driveway and garage. Conveniently it is only a short drive to local amenities and transport links.